Submitted photo The Wounded Warrior Amputee Softball Team exhibition games at Wright State’s Nischwitz Stadium on Oct. 13 at 9 a.m. and 2 p.m.
FAIRBORN — The Wounded Warrior Amputee Softball Team — athletic military veterans and active-duty soldiers who have lost limbs — will play exhibition games at Wright State University to raise money for veterans causes and honor Gold Star Families, whose members have died in military service. The two games, co-sponsored by the Veteran and Military Center at Wright State University, will be played on campus at Nischwitz Stadium 9 a.m. and 2 p.m. Saturday, Oct. 13. Suggested donation for admission is $5. The first game will pit the Wounded Warriors against local Military and 1st Responder All-Stars; the second game will have the Dayton Legends Softball Club All-Stars challenging the Wounded Warriors. Those benefiting from game proceeds include Fisher Houses, which provide a compassionate-care environment for military families to stay together during times of medical emergencies or crises; Honor Flight-Dayton, a nationally known veterans program that transports veterans from World War II and the Korean and Vietnam wars to war memorials in Washington, D.C.; and Combat Outpost Robinson, an Ohio organization that helps 9/11 combat veterans who have from post-traumatic stress disorder. This will be the third year the Wounded Warriors have played at Wright State. Proceeds from last year’s games sent a Dayton-area amputee child to the Wounded Warriors Kid’s Camp, held in Manchester, New Hampshire. The Wounded Warrior Amputee Softball Team is not affiliated with other charities with the words “Wounded Warrior” in their names. Since the inception of the amputee softball team, more than 85 percent of its donations have supported programs helping military amputees, amputee children and medical research. For more information email dayton_softball@hotmail.com. 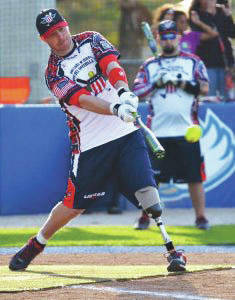 https://www.fairborndailyherald.com/wp-content/uploads/sites/50/2018/10/web1_wounded-warrior-softball-team-235×300.jpgSubmitted photo The Wounded Warrior Amputee Softball Team exhibition games at Wright State’s Nischwitz Stadium on Oct. 13 at 9 a.m. and 2 p.m.